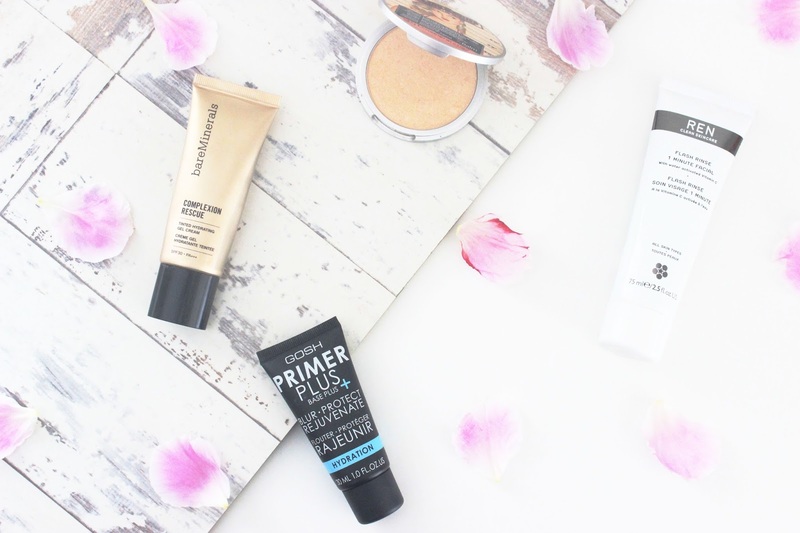 If you've read my blog, Pint Sized Beauty before then you will be no stranger to my love of dewy skin and my craving to get the glow all year around. I've tried an endless amount of products that claim to boost the skins radiance, but today I thought I'd give you the run down of the handful of products I reach for whenever I need a quick fix. Gosh Primer Plus + Hydration* | £13.99 | Link | After moisturiser, the next important step in my regime is primer. I usually reach for more pore refining primers, but when my skin looks lacklustre, nothing packs a punch more than the Gosh Primer Plus + Hydration Primer. The texture isn't too heavy, so it doesn't weigh the skin down, but it helps to prolong foundation wear, especially under eye concealer. It blurs, protects and rejuvenates the skin, smoothing over my imperfections and making sure my skin's moisture is retained. bareMinerals Complexion Rescue Tinted Hydrating Gel Cream | £26 | Link | During the hotter months, my skin craves light bases that moisturise and conceal any blemishes. Cue the Bare Minerals Complexion Rescue, a BB/Tinted moisturiser hybrid which hydrates the skin, whilst improving its overall look and texture. Since it's release earlier the year, I have been using it daily. Not only does it feel lightweight on the skin, it has improved my skin's appearance and has given me my glow back. I have a full review of this product over on my blog here. REN Flash Rinse 1 Minute Facial* | £32 | Link | After claiming this product as my own a couple of months back, I have been surgically attached to it ever since. If you're looking for a quick fix to improve lacklustre skin, then nothing does it faster than this. It evens out and clears the skin, whilst using water activated vitamin c to brighten, tone and maintain the skins's natural radiance. If you would like to see my full review then head here. theBalm Mary Lou Manizer | £17.50 | Link | If there's one beauty product I will continue to buy it's highligher, my skin craves it and my make up never looks complete without it. For me, the highligher I reach for whenever in doubt is theBalm's Mary Lou Manizer. The finely milled, buttery texture blends seamlessly into the skin allowing for controlled application. This honey hued highligher increases the skin's radiance, without running the risk of looking sweaty or like a disco ball - Bonus. What products do you rely on when you want to make your dull skin glow? Make sure you head over to Lily’s blog and say hello!